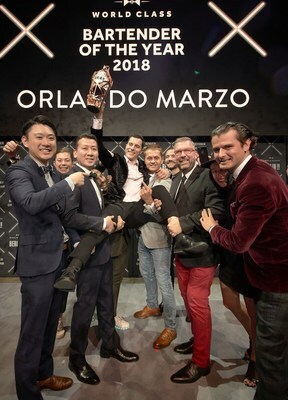 Orlando Marzo, from Melbourne’s acclaimed Lûmé restaurant, has been named the world’s best bartender by the largest global bartending competition, WORLD CLASS Global Bartender of the Year 2018. Orlando competed against over 10,000 bartenders from every corner of the globe. The competition lasted six months, with over one hundred challenges and countless cocktails. It culminated in a four-day final, where 56 of the best bartenders in the industry battled it out in Berlin. The standard this year was truly exceptional, but Orlando stood out as the best of the best. Armed with Diageo’s award-winning Reserve brands, he blew the judges away, taking sustainable bartending further than ever before in the Ketel One ‘Better Drinking’ challenge, and reigning supreme in the ‘Flavours of a Nation’ round with his innovative twist on the classic Johnnie Walker Black Label Highball. To seal the deal, he went head-to-head with his fellow competitors in the ‘Cocktail Clash’ Grand Finale and brought the house down with one show-stopping creation after another. Orlando has an incredible year ahead of him – he will have the chance to travel the world as a Diageo representative, making bespoke drinks in exotic and far-flung locations and judging competitions. He will also join a roll call of the industry’s finest, becoming the 10th member of the WORLD CLASS Hall of Fame.